New Pulp has no flagship. No Admiral on Earth could keep these particular frigates from sailing joyously off in whatever direction they please. But…if New Pulp DID have a flagship, it would probably be Cirsova. Under P. Alexander’s leadership, the magazine has acquired a wide enough following to lock down a Hugo nomination, and will soon publish its seventh issue. 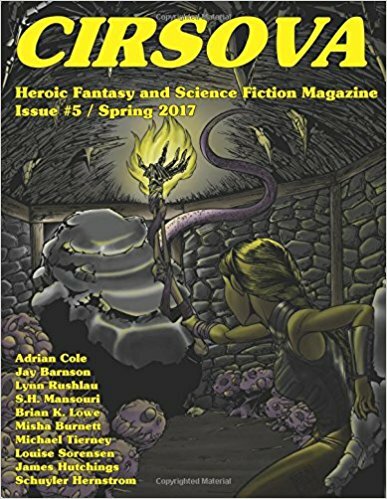 Issue #5 is seen by many as a particular bright spot for Cirsova, with stories nominated for both the Planetary and Ursa Major awards. Recognizing the opportunity to achieve a wider readership, the editors elected to make the issue free via Amazon for a week. I like New Pulp, for the most part. I like free things even more. I jumped at the chance. Cirsova #5 is divided more or less evenly between standard tales of pulp adventure and a thematically linked series of stories from Misha Burnett’s “Eldritch Earth” universe. The editor describes the concept as a sort of Lovecraft-Burroughs fusion: the setting is the Earth during the Triassic era, at the tail end of its occupation by squamous alien entities who have not yet retreated to their slumber beneath the glaciers. The Great Race are still hanging around their back porches, where they shake their pseudopods irascibly at the kids in their yards, while various subject races of their creation squabble for control of the primordial world. One of those subject races is humanity, and it’s on that basis that the writers seek to wed the “sword and planet” heroic fiction concept to the Lovecraftian milieu. This begs the question: what IS Lovecraftian fiction? For me, the defining characteristic is a cosmic horror born of the sudden realization that humanity is not, in fact, at the top of the food chain; indeed, that from a universal perspective, we’re not even insects. Lovecraft posits that entities exist whose motives are not exactly malevolent, but so far beyond our understanding that to even encounter them is a sanity-shattering experience. Bluntly, I don’t know that this leaves much room for the heroic. I don’t think Lovecraft’s stories would have been improved if Randolph Carter had been handed an SMG and he’d started mowing down shoggoths. New Pulp is a celebration of human ability and potential. Lovecraft’s message is “your abilities are irrelevant in a cosmic context, and you are potentially something’s dinner.” I don’t think, in short, that heroic fiction can be made Lovecraftian by gluing some tentacles to it. All the stories of Cirsova #5 are well-written on a line-by-line level, but there are times when the conceptual tensions show. The stories work least well when they try to transplant Robert E. Howard to the Triassic, with brawny iron-age heroes mowing down scads of enemy henchmen and advancing towards boss fights. Additionally, the whole Eldritch Earth concept is still in an early stage developmentally, and as with other such experiments (notably Baen’s Grantville) there are times when the authors involved seem to be proceeding from fundamentally incompatible concepts of how the story’s world works. I can just about buy that humanity was designed as a slave race by Mind Flayers, but what’s up with all these other late-Pleistocene mammals popping up all over the place? The horses? The dogs? The tapirs? Or even Cretaceous critters such as birds, for that matter? These aren’t story-killers, but they’re anti-atmospheric and destructive of reader immersion, and the Eldritch Earth stories will become more fun for readers once the authorial community leaves the tropes of iron-age Earth behind. Now, all that aside, there is some damned good stuff in here. In fact, in spite of my conceptual misgivings, the Eldritch Earth stuff is as a whole the better half of the issue. Three stories in particular stood out to me. My favorite is actually not one of the two award nominees; rather, I’d opt for the Eldritch Earth creator’s own contribution, IN THE GLOAMING O MY DARLING by Misha Burnett. Burnett’s tale is, for me, the most Lovecraftian of the bunch, in the sense that it places its two young protagonists in a helpless position at the mercy of alien enemies with inhuman agendas. The pathos of their situation is well-conveyed; both characters pop as individual personalities and earn the audience’s rooting interest. In addition to being a skilled crafter of characters, Burnett shows a willingness to abandon the conventions of heroic fantasy when doing so serves the story. Schuyler Hernstrom decidedly does not abandon the conventions of heroic fantasy. But why the hell would we want him to? Some people are just right for their role, and Hernstrom is unmistakably right as an author of New Pulp. The Planetary Award-nominated THE FIRST AMERICAN is a story born of a genuinely brilliant twist on the Eldritch Earth formula, the nature of which is foreshadowed in the title. Unmistakably Barsoomian in its approach, the story is action-focused in the extreme, the plot not so much advanced in stages as shot out of a cannon. And only a fool would wish it to be otherwise. In the passages above, I’ve been dismissive of the “slaughter henchmen en route to the boss” formula, but damnit, we NEED that sort of story sometimes, and there’s a huge difference between seeing that sort of story done well and seeing it done badly. Hernstrom does it so well that I worry he may have been born seventy years too late to find his audience. Hernstrom is potentially the paradigm-defining author of New Pulp. I was also a big fan of S.H. Mansouri’s Ursa Major-nominated BEYOND THE GREAT DIVIDE, the title of which describes the author’s daring decision to adopt the perspective of the insectile Slagborn, one of humanity’s rival races. Looking at humanity through segmented eyes, Mansouri successfully conveys a very Lovecraftian sense of human fragility and impossible odds, but succeeds nonetheless in conveying a sense of hope. In particular I respect Mansouri’s judgment in rejecting the obvious authorial decisions—rather than going with the “hive mind” concept, he adopts a more interesting perspective that fuses individual identity with collective reasoning, and rather than rejecting emotional influences on his perspective characters, he permits them to be influenced by them in insidious ways, with full awareness, as if anger were a drug. Cirsova #5 is, above all else, a reminder of what wonderful days these are to be an author and a reader. Even five years ago, these authors would have been scrambling to shape their unique visions to a corporate audience, and those who enjoy their work would have been subsisting on inferior scraps from other sources. Technology truly has proven liberating for both creators and their audiences. Here’s hoping that Cirsova’s still around to scratch its readers pulp itch for a long, long time.